When you suffer with acne, obviously the major breakouts are the most difficult to deal with. But what can be just as annoying is that single pimple popping up right in the middle of your nose or forehead. These single pimples can be an indication of a larger outbreak coming, or they can just be isolated events that come at the worst possible time. Imagine getting up on the first day of your vacation with a huge pimple making an appearance? Or you’re heading out for a first date? The unfortunate reality is that these things always happen when you least want them. The great thing is that when you have these isolated pimples there are spot treatments available that are extremely effective. They attack the source of the problem in a way that you wouldn’t want to do with a full outbreak. But for the isolated spots they are the best solution. 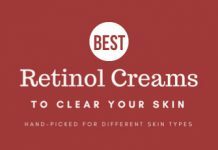 To help you make a choice from all the products out there we have done all the necessary research and listed out the best options based on skin type and effectiveness. Now, I’m assuming this is not the first time you’ve browsed the internet in search for a product you can use to get rid of your acne. And you have to agree that there are hundreds if not thousands of potential products for acne treatment to choose from. 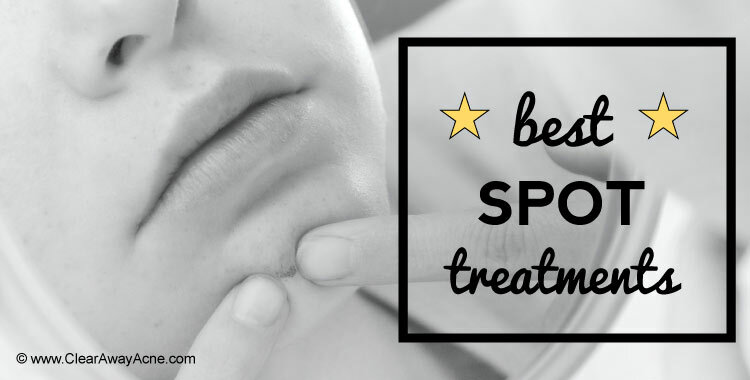 In order to get best results from a spot treatment for acne, you have to know for which skin type it works best, and the exact benefits and drawbacks it has. If you're in a rush, below are the Best Acne Spot Treatments, hands down! One of the major on-the-surface causes of acne formation are bacterial overgrowth and pore clogging. When excess oil, dirt, and dead skin cells accumulate in the hair follicle, they clog your skin pores, which initiates bacterial overgrowth – resulting in an inflammatory acne lesion. This acne treatment serum works by eliminating your acne right where it forms, the hair follicle. Benzoyl peroxide unclogs your skin pores, eradicates acne causing bacteria, while other natural ingredients such as green tea extract and tea tree oilprovides your skin with the necessary soothing sensation. Best For: All skin types, including dry and sensitive skin. Works great as a spot treatment, and is also suitable for regular use. Dries out your pimples without overly drying your skin. Free from harsh chemicals, only contains the proven anti bacterial agent, benzoyl peroxide to eliminate acne from its roots. Absorbs well into your skin, doesn’t leave a bothering residue. Does not provide you with instant results. Can cause allergic reactions to certain skin types. So, make sure to do a patch test first and then go on for a full fledged application. This is not a flashy product, it doesn’t have a lot of celebrity endorsements, but it works. It’s affordable, and it has a lineup of ingredients that you can pronounce. If you’re looking for a simple solution that can help you get rid of acne fast, this is your option. Its prominent natural ingredients include ginseng, green tea, and several other antioxidants. It also has salicylic acid to ensure that your dermis gets an added push of cleaning. Best For: All skin types, however, oily skin can be helped greatly. Contains mostly natural ingredients, and it doesn’t feel harsh on your skin, which makes it suitable for sensitive skin types. Kills two birds with one stone. Spot clean, or use on a daily basis, it’s up to you. Oil-free formulation won’t leave your skin excessively oily. Can be over drying for many. If it does so, you can follow it up with a moisturizer to minimize the effects. Though it says it can be used as your regular cleanser, it is not recommended as it can be over drying. If you’re a loyal fan of Neutrogena, it won’t be hard for you to associate this brand with quality products. It definitely delivers a powerful punch, as evidenced by the many positive reviews that people have given this spot treatment gel. Best For: Oily, acne prone skins. Dry and sensitive skins, be careful! Strong presence of active ingredient benzoyl peroxide ensures you get maximum impact. This helps not only clear the face, but also help with dermal tissue irritation. Cost effective – one bottle goes a long way. Can leave your areas over dried, even if you’re used it as a spot treatment. Doesn’t provide instant results, but it does work with regular application. If you’re an acne sufferer, it’s likely that you’ve heard about this brand time and again. Murad has a lineup of at least 25 items that you can choose from to help getting rid of your acne. You will not find many other companies with the same diversity of products and focus on acne treatment, that’s for sure. Best For: All types of skin, especially acne prone. Use this on your acne spots and you’ll find relief within a few hours. And with regular use, you should be back to having a clear skin. Uses the proven anti-acne ingredient benzoyl peroxide to fight acne causing bacteria and cleanse clogged skin pores. Doesn’t just help fading your current spots, but also helps preventing future breakouts. Doesn’t over-dry like most spot treatments for acne. Works optimally in conjunction with other products included in Murad regimen. There are a lot of different acne medications on the market, but the Acnefree Terminator Spot Treatment is definitely one that you should take a look at. Best For: Meant for oily acne prone skin, but can work for combination skin as well. Utilizes benzoyl peroxide in its strongest (10%) concentration to eradicate acne out of your face. Strong medication comes with an added benefit of faster results. Doesn’t leave a white, dusty residue that most spot treatments for acne tend to leave after application. Relatively inexpensive compared to other solutions on the market today. 10% BPO can be very strong for dry and sensitive skins. 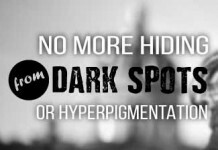 Not all skins can tolerate this strong spot treatment. So, start with a gentle application, and if excessive itching and burnings occurs, discontinue use. Clean & Clear has a prominent share of goodwill among vast majority of skincare junkies. And this spot treatment for acne is a testament to that. With a huge amount of raving feedback from users lately, and is definitely one of the best options that you pursue today. Best For: For combination to normal skin. Tested and proven to help with reducing oil and blemishes on the skin. 2% salicylic acid acne medication penetrates into your skin pores and cleanses of dead skin cells and unwanted residue. Doesn’t over dry your skin. Made to delivery instant results – their user study revealed 100% of testers saw clearer skin within 1 day! Requires continuous usage to keep your skin clear of acne. Has a thick, gel like texture that is not admired by most. The treeActiv Cystic Acne Spot Treatment works with cleaning the skin on a lot of different levels. It uses the power of tea tree oil and clay to help clean the skin and remove outbreaks of acne fast. Natural ingredients based treatment, best for dry and sensitive skin. It can deep cleanse your skin and improve complexion within a matter of hours, and will continue to work after you wash it off. Works both as a spot treatment and cleanser. Has a nice smell and leaves your skin with a smooth and fresh sensation. Leaves a residue on your skin after rinsing off. All natural ingredients don’t work for everyone. If you were anticipating a natural spot treatment and have not come across Burt’s Bees, you’ve been missing out. This spot treatment from Burt’s Bees uses a variety of natural ingredients and the added pore opening properties of salicylic acid to clear those acne spots from your skin. Best For: All skin types, including dry and sensitive skins. But extra caution needs to be observed with dry and sensitive skins. It’s powerful, potent, and natural. You’ll find that just a little goes a long way, as this is a concentrated option that is not meant to be more than a spot treatment. Goes to work right away. Has an unpleasant smell, and can also leave your skin with a stinging sensation. Salicylic acid doesn’t suit everyone, so make sure you’re not allergic to it before using this product. If you’re looking for a solution that is natural and effective, this is a solution that is going to pay off dividends. The active ingredients go to work upon applying it to the skin, and you’ll start to see an improvement within a few hours. Presence of natural ingredients helps minimizing bacterial growth and inflammation on the skin. The botanicals not only clean up the acne, they soothe, and deliver moisture where you need it most. No harsh chemicals are used. Free from artificial fragrance and parabens. Easy to over apply, which then can result in dryness and irritation. Not a good option for dry and sensitive skins. Philosophy Clear Days Ahead Spot Treatment utilizes salicylic acid and a unique antimicrobial formulation to get rid of your acne, while not irritating your skin. If you’re looking for a product that fades your acne spots fast and doesn’t over dry your skin, this might be the right choice for you. Best For: All skin types. Not an ideal option for oily skin. The strong salicylic acid treatment penetrates deep into your skin and sheds dead skin cells and dirt that might be clogging your skin pores. Antimicrobial properties help clearing acne causing bacteria right off the bat. While other options may dry your skin, this moisturizes just the right way. Doesn’t cause irritation like most acne spot treatments. Its barrier rejuvenation complex soothes the redness and irritation from blemishes. Added moisturizer can cause excessive oiliness on your skin. Pricier as compared to other treatments we’ve reviewed on this page. Proactiv is one of the major players in the anti acne products industry. And the reason they’ve survived and thrived ever since their inception is that they produce solutions that actually deliver results. This emergency blemish relief, just as the name suggests, is a spot treatment that is meant to provide you with instant relief from acne breakouts. Best For: For oily skin to combination skin, but can be safe for all. Utilizes the tested and proven benzoyl peroxide acne medication to fight acne causing bacteria on your skin. This penetrates deep into your skin and eliminates pore clogging, one of the primary causes of acne. Doesn’t cause as much itching, burning, and issues that most acne spot treatments cause. Can provide relief in a short span of time. Proactiv products tend to work better with their complete regimen. Standalone products don’t have the same success rates. A bit higher priced, but it’s effective overall. People that are looking for all natural acne relief will find that there’s a lot of companies pushing good products. That’s what you’re going to get when you pick up Unblemished Acne Spot Treatment by Elements of Beauty. A little goes a long way with this one, but the soothing relief that comes with it is unmatched, so take a look. Best For: For combination skin, but can work with dry skin too. Contains a unique combination of retinol serum, aloe vera, salicylic acid, and essential oils to fight acne spots on your skin. Salicylic acid penetrates deep into your skin pores, and the aloe vera providses your skin with a soothing touch. Unlike other options that cause a burning sensation when applied, the presence of aloe vera and other natural ingredients in this acne treatment won’t let it happen. Only works for treating mild to moderate acne blemishes. The X Out 90 Day Wash-In Combo with Spot Corrector Acne Treatment is a combination of two products. You’re going to get a wash-in treatment, and a spot treatment. These work together to ensure that you’re getting a helping hand in regards to your overall skin care regimen. If your goal is to get a clearer face, and you want to do it for more than just one night, this is the product line up for you. Best For: All skin types, but not ideal for sensitive skin. Can guarantee long term effects with continuous usage. Benzoyl peroxide used in this treatment is a proven anti-acne ingredient. You just have to ensure that you’re not allergic to it before getting your hands on this product. Doesn’t cause excessive dryness on your skin. Works for all age-groups, specially teenage acne. Highest price mark among the products we’ve reviewed here. But it’s also the one having two products, not just one. Not a quick acne treatment. You have to use it continuously to get results. Can easily bleach your fabrics. So, be careful when you’re putting on your favorite outfits. This drying lotion from Mario Badescu works by drying out the oils and blemishes that you have, without having to spread it across your entire face. If you have whiteheads, apply this directly to them, and within 24 hours, you will see results. Best For: Oily skin and combination skin. With salicylic acid and calamine make up a unique combination to fight acne on your skin. This dual action is one of the reasons why so many people recommend this option overall. Good at tackling mild forms of acne including blackheads/whiteheads and mild pustules. Designed to work fast and can deliver results within 24 hours. Reduces excess oil and clogs without being harsh on your skin. Formulation is heavily based on harsh ingredients such as titanium oxide and talc. Can’t help fighting cystic acne. Sulfur (ingredient present in it) is a good anti-acne ingredient. But it doesn’t suite everyone. So, before buying it, make sure you don’t have sulfur intolerance. Best For: All, except extremely dry and sensitive skin. Sulfur based treatment works well against acne causing bacteria. Proven effective against small to large acne breakouts. One of the rare products that are marked safe to be used during pregnancy. No Fragrance or added ingredients. Can be rough on dry skin. Now, because it’s also a cover up solution, it best suits pale skin tones. Won’t be a good option if you’re very fair (in case you’re using it as a cover up treatment). Moving forward with some of the best reviewed spot treatments, you’re going to find Suki Transformative Purifying Masque is a perfect solution for the most odd skin types. You’ll find that this can clean pores, and clear out acne within a matter of hours. Best For: All skin types, including dry and sensitive skins. This changes the pH levels of your skin so that you are able to reduce the blemishes you have, clarify the skin, and reduce redness outright. Contains 100% natural ingredients, which makes it a perfect choice for sensitive skin types. Has moisturizing properties that help with soothing your skin. It’s higher priced than others, but that’s because it’s so effective, and it’s very concentrated. Can cause redness for short periods of time. Those looking for a natural option will already know about the Origins brand. This spot removing gel from Origins contains a blend of time-tested salicylic acid acne treatment with a touch of natural ingredients to clear out your breakouts fast. Best For: For oily to combination skin, not for dry and sensitive skins. Contains natural ingredients that are meant to heal, conceal, and improve skin on the go. At under an ounce, you can expect a powerful antioxidant, anti-bacterial, anti-inflammatory solution. Promises to give results in a matter of hours. You don’t need much of it, just a little tiny spot and you’ll be able to feel the penetration of medication through the skin. Not a cheap option to go with. This is the second spot treatment form Neutrogena we’ve included in this post, for a good reason. They work with acne treatments of all types, but one thing that people complain about when dealing with the company is that they don’t often have natural options. But this is not the case with this product. This is a natural option that uses 93% natural ingredients. Unique anti blemish formulation includes wintergreen and salicylic acid from natural sources. Not just helps reducing acne, but also fades redness leaves your skin with a soothing sensation. Salicylic acid included in this product can be over drying for sensitive skin types. Could tomatoes be the secret to your acne treatment? Well, you need to check Yes To Tomatoes Acne Treatment Spot Stick to find out the answer. It contains 97% natural ingredients. Tomatoes, with their antioxidants, help protecting your skin from bodily environmental elements that cause pore clogging on your skin. Best For: For all skin types, except sensitive skin. Salicylic acid fights pore clogging elements on your skin. Ginseng and bisabolol eliminates redness and peeling, and leave your skin with calming sensation. Primarily a natural acne treatment, with a touch of proven anti-acne ingredient such as salicylic acid. Just a little goes a long way, and it definitely showcases a great deal of results fast. Not to be taken as a completely natural product. Because it does contain salicylic acid, it can cause dryness if used without caution. Can cause redness/peeling on sensitive skin types. If you’re looking for spa level treatments, then you will definitely want to check out This spot treatment product from La Roche-Posay. The #1 Skincare Brand from Europe has something special with this product for you. It’s made of natural ingredients, has no oil, and has been proven effective against unwanted blemishes. Formulated with a micro-abrasion elements, which penetrate the dermis and clear acne from where it begins. Benzoyl peroxide dries out blemishes, and the added ingredients help moisturizing your skin at the same time. Free from parabens, added oil, and artificial fragrance. Doesn’t always provide instant results. Works optimally in conjunction with other products. There you have it. These were the 20 best acne spot treatments of 2019. Some work faster than others, some are 100% natural, others are chemically derived. Each one is tested and proven to give best results. You just have to pick one that tailors to your needs. If you have an outbreak of acne, turn to these options as a first line of defense, then work with a cleanser that will help you overcome the problem long term.